Priyadarshini Park is located in the heart of Chennai, a 5-minute drive from Central and Egmore Railway Stations. Offering a spa and 24-hour coffee shop, the hotel provides free parking. Rooms at Priyadarshini Park come with a seating area and a flat-screen TV. Some rooms also include a mini fridge and a work desk. Private bathrooms provide a hot and cold shower. Guests can choose from a variety of traditional Thai massages at the spa. The hotel has a 24-hour reception and a travel desk providing tour bookings, ticketing services, and airport transfers. Wi-Fi is free in public areas. Buffet breakfast is served daily. Meals can be enjoyed at the 24-hour coffee shop, or delivered to guests’ rooms. The marine-themed Submarine basement bar offers light snacks and a variety of champagnes and wines. Priyadarshini Park is 16 km from Chennai International Airport. Free! All children under 9 years stay free of charge when using existing beds. Free! One child under 2 years stays free of charge in a child's cot/crib. 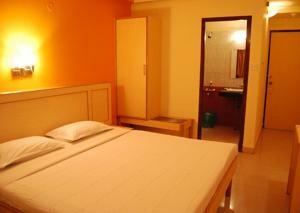 One older child or adult is charged INR 675 per night and person in an extra bed. Maximum capacity of extra beds/children's cots in a room is 1. Any type of extra bed or child's cot/crib is upon request and needs to be confirmed by the hotel. Supplements will not be calculated automatically in the total costs and have to be paid separately in the hotel. American Express, Visa, JCB, Maestro The hotel reserves the right to pre-authorise credit cards prior to arrival.